Dell's new Inspiron hybrids take a page from Lenovo's pioneering Yoga design, but in checking them out at Computex, I found them to be a little too thick and heavy to really serve as tablets. Dell was showing preproduction models of the hybrids at the Taipei show, and I was able to play with them for a short while -- Dell had me on a timer so it was indeed a very short while! The new models feature a solid steel finish that give them a shiny look. The Inspiron 11 3000 starts at US$449 -- making it one of the cheapest in its class -- and has an 11.6-inch screen. The Inspiron 13 7000 has a 13-inch screen but Dell hasn't given out pricing for it. The hybrids have a screen that rotates 360 degrees to turn a laptop into a tablet, but a fair bit of force had to be applied on the hinge to rotate the screen panel from laptop to tablet form. 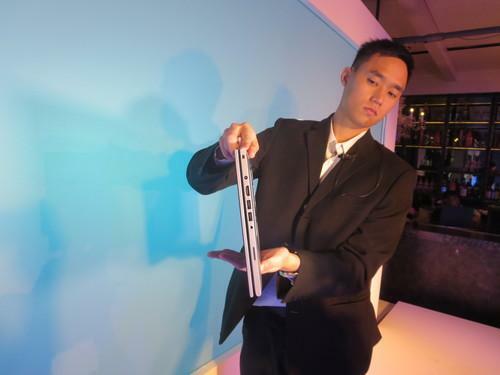 Both are 19.44 millimeters thick, which is slightly thicker than the Yoga 2, which is 17.2 mms. The Windows 8 user interface was viewable on the screens from multiple angles. Under the displays were Windows buttons, like the ones found on Windows tablets. The keyboard had steel buttons and provided a good feel when typing. The first hybrid I tried was the Inspiron 11, which weighs 1.39 kilograms and is rather difficult to hold in one hand as you would a tablet. The touchscreen -- showing images at a 1366 x 768-pixel resolution -- stopped working after switching from laptop to tablet mode. After multiple attempts to fix it, the unit was hauled away by a Dell representative for repairs. As a result, I couldn't test the hybrid's Intel Bay Trail processor. Dell says the battery lasts around eight hours. The Inspiron 11 is slated to ship on June 19. Next up was Inspiron 13, which weighs 1.66 kgs. It really felt more like a laptop and unnatural as a tablet. Thankfully, the touchscreen worked, and applications zipped with Intel's fast Core processor. The screen was sensitive and responded to finger movement swiftly. But the hybrid was slow to respond to changes in screen orientation, with a lag time of a second or more. The Inspiron 13 has a 1920 x 1080-pixel screen, and battery life of around six hours. The Inspiron 13 will ship in September. But in a market where detachables are gaining in popularity and lighter hybrids are available, the Inspiron 13 may be better suited for use as a laptop than a tablet.